Vintage drawing of a grapevine growing up a wall. 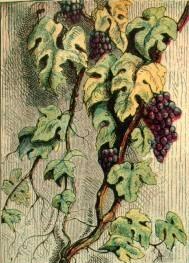 This public domain food image shows five bunches of lovely purple grapes hanging on the vine just waiting to be picked. Ooh, yummy.